This straight stair is 42 inches wide, approximately 10 feet to the mid landing, and 2 feet to the finish floor. The stairway starts at the bottom floor up to a mid landing and up three more treads to the finish floor. The handrail is continuous from floor to floor with a goose neck at the mid landing. This stair was shipped in three sections and field welded in place. The stringers and landing frame are made out of MC 10 x 8.6 heavy duty channel. 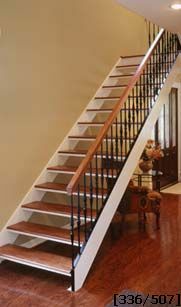 The handrail is a # 235 (2 1/4" x 2 3/8") molded oak, the balusters are a # 326 (hammered forged), installed 6" on centers with a balcony rail to match. The treads are a # 120 (12 gauge) pan type with a wood overlay with a nose. The finish is a white oxide primer and the wood has a natural finish. The final paint and stain were applied by others at the job site.